§ The foundational accusation of Russiagate was, and remains, charges that Russian President Putin ordered the hacking of DNC e-mails and their public dissemination through WikiLeaks in order to benefit Donald Trump and undermine Hillary Clinton in the 2016 presidential election, and that Trump and/or his associates colluded with the Kremlin in this “attack on American democracy.” As no actual evidence for these allegations has been produced after nearly a year and a half of media and government investigations, we are left with Russiagate without Russia. (An apt formulation perhaps first coined in an e-mail exchange by Nation writer James Carden.) Special counsel Mueller has produced four indictments: against Gen. Michael Flynn, Trump’s short-lived national-security adviser, and George Papadopolous, a lowly and inconsequential Trump “adviser,” for lying to the FBI; and against Paul Manafort and his partner Rick Gates for financial improprieties. None of these charges has anything to do with improper collusion with Russia, except for the wrongful insinuations against Flynn. Instead, the several investigations, desperate to find actual evidence of collusion, have spread to “contacts with Russia”—political, financial, social, etc.—on the part of a growing number of people, often going back many years before anyone imagined Trump as a presidential candidate. The resulting implication is that these “contacts” were criminal or potentially so. This is unprecedented, preposterous, and dangerous, potentially more so than even McCarthy’s search for “Communist” connections. It would suggest, for example, that scores of American corporations doing business in Russia today are engaged in criminal enterprise. More to the point, advisers to US policy-makers and even media commentators on Russia must have many and various contacts with Russia if they are to understand anything about the dynamics of Kremlin policy-making. Cohen himself, to take an individual example, was an adviser to two (unsuccessful) presidential campaigns, which considered his wide-ranging and longstanding “contacts” with Russia to be an important credential, as did the one sitting president he advised. To suggest that such contacts are in any way criminal is to slur hundreds of reputations and to leave US policy-makers with advisers laden with ideology and no actual expertise. It is also to suggest that any quest for better relations with Russia, or détente, is somehow suspicious, illegitimate, or impossible, as expressed recently by Andrew Weiss in The Wall Street Journal and by The Washington Post, in an editorial. This is one reason Cohen, in a previous Batchelor broadcast and commentary, argued that Russiagate and its promoters have become the gravest threat to American national security. § Russiagate began sometime prior to June 2016, not after the presidential election in November, as is often said, as an anti-Trump political project. (Exactly why, how, and by whom remain unclear, and herein lies the real significance of the largely bogus “Dossier” and the still murky role of top US intel officials in the creation of that document.) That said, Cohen continues, the mainstream American media have been largely responsible for inflating, perpetuating, and sustaining the sham Russiagate as the real political crisis it has become, arguably the greatest in modern American presidential and thus institutional political history. The media have done this by increasingly betraying their own professed standards of verified news reporting and balanced coverage, even resorting to tacit forms of censorship by systematically excluding dissenting reporting and opinions. (For inventories of recent examples, see Glenn Greenwald at The Intercept and Joe Lauria at Consortium News. Anyone interested in exposures of such truly “fake news” should visit these two sites regularly, the latter the product of the inestimable veteran journalist Robert Parry.) Still worse, this mainstream malpractice has spread to some alternative-media publications once prized for their journalistic standards, where expressed disdain for “evidence” and “proof” in favor of allegations without any actual facts can sometimes be found. Nor are these practices merely the ordinary occasional mishaps of professional journalism. As Greenwald points out, all of the now retracted stories, whether by print media or cable television, were zealous promotions of Russiagate and virulently anti-Trump. They, too, are examples of Russiagate without Russia. § Leaving aside possible financial improprieties on the part of General Flynn, his persecution and subsequent prosecution is highly indicative. Flynn pled guilty to having lied to the FBI about his communications with the Russian ambassador, Sergey Kislyak, on behalf of the incoming Trump administration, discussions that unavoidably included some references, however vague, to sanctions imposed on Russia by President Obama in December 2016, just before leaving office. Those sanctions were highly unusual—last-minute, unprecedented in their seizure of Russian property in the United States, and including a reckless veiled threat of unspecified cyber attacks on Russia. They gave the impression that Obama wanted to make even more difficult Trump’s professed goal of improving relations with Moscow. Still more, Obama’s specified reason was not Russian behavior in Ukraine or Syria, as is commonly thought, but Russiagate—that is, Putin’s “attack on American democracy,” which Obama’s intel chiefs had evidently persuaded him was an entirely authentic allegation. (Or which Obama, who regarded Trump’s victory over his designated successor, Hillary Clinton, as a personal rebuff, was eager to believe.) But Flynn’s discussions with the Russian ambassador—as well as other Trump representatives’ efforts to open “back-channel” communications with Moscow–were anything but a crime. As Cohen pointed out in another previous commentary, there were so many precedents of such overtures on behalf of presidents-elect, it was considered a normal, even necessary practice, if only to ask Moscow not to make relations worse before the new president had a chance to review the relationship. When Henry Kissinger did this on behalf of President-elect Nixon, his boss instructed him to keep the communication entirely confidential, not to inform any other members of the incoming administration. Presumably Flynn was similarly secretive, thereby misinforming Vice President Pence and finding himself trapped—or possibly entrapped—between loyalty to his president and an FBI agent. 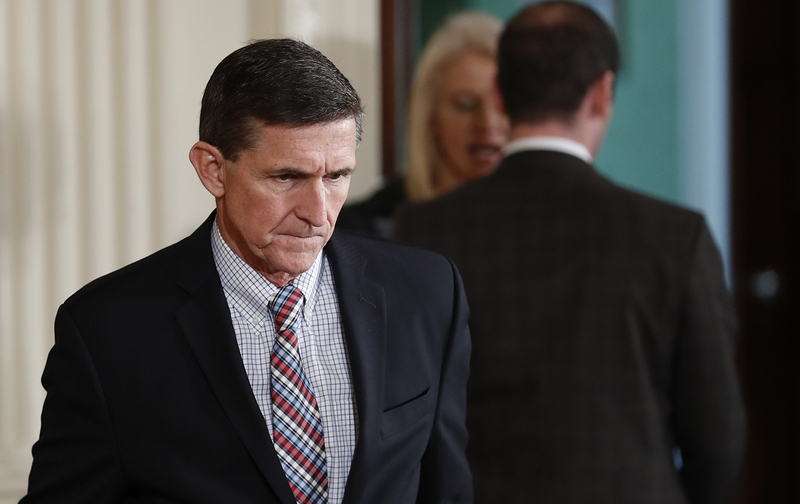 Flynn no doubt would have been especially guarded with a representative of the FBI, knowing as he did the role of Obama’s Intel bosses in Russiagate prior to the election and which had escalated after Trump’s surprise victory. In any event, to the extent that Flynn encouraged Moscow not to reply in kind immediately to Obama’s highly provocative sanctions, he performed a service to US national security, not a crime. And, assuming that Flynn was acting on the instructions of his president-elect, so did Trump. Still more, if Flynn “colluded” in any way, it was with Israel, not Russia, having been asked by that government to dissuade countries from voting for an impending anti-Israel UN resolution. § Finally, and similarly, Cohen points out, there is the ongoing effort by the political-media establishment to drive Secretary of State Tillerson from office and replace him with a fully neocon, anti-Russian, anti-détente head of the State Department. Tillerson was an admirable appointee by Trump—widely experienced in world affairs, a tested negotiator, a mature and practical-minded man. Originally, his role as the CEO of Exxon Mobil who had negotiated and enacted an immensely profitable and strategically important energy-extraction deal with the Kremlin earned him the slur of being “Putin’s pal.” This preposterous allegation has since given way to charges that he is slowly restructuring, and trimming, the long bloated and mostly inept State Department, as indeed he should do. Numerous former diplomats closely associated with Hillary Clinton have raced to influential op-ed pages to denounce Tillerson’s undermining of this purportedly glorious frontline institution of American national security. Many news reports, commentaries, and editorials have been in the same vein. But who can recall, Cohen asks, a major diplomatic triumph by the State Department or a secretary of state in recent years? The answer might be the Obama administration’s multinational agreement with Iran to curb its nuclear-weapons potential, but that was due no less to Russia’s president and Ministry of Foreign Affairs, which provided essential guarantees to the sides involved. Forgotten, meanwhile, are the more than 50 career State Department officials who publicly protested—in the spirit of DOD—Obama’s rare attempt to cooperate with Moscow in Syria. Call it by what it was: the sabotaging of a president by his own State Department. In this spirit, there are a flurry of leaked stories that Tillerson will soon resign or be ousted. Meanwhile, however, he carries on. The ever-looming menace of Russiagate compels him to issue wildly exaggerated indictments of Russian behavior while, at the same time, calling for a “productive new relationship” with Moscow, in which he clearly believes. (And which, if left unencumbered, he might achieve.) Evidently, he has established a “productive” working relationship with his Russian counterpart, Sergey Lavrov, the two of them having just announced North Korea’s readiness to engage in negotiations with the United States and other governments involved in the current crisis. Tillerson’s fate, Cohen concludes, will tell us much about the number-one foreign-policy question confronting America: cooperation or escalating conflict with the other nuclear superpower, a détente-like diminishing of the new Cold War or the growing risks that it will become hot war. Politics and policy should never be over-personalized; larger factors are always involved. But in these unprecedented times, Tillerson may be the last man standing who represents the possibility of some kind of détente. Apart, that is, from President Trump himself, loathe him or not. Or to put the issue differently: Will Russiagate continue to gravely endanger American national security?